Boasting more than 9,000 entries, the International Wine Challenge (I.W.C.) is the biggest blind tasting contest in the world. Presiding over a team of 450 judges, I.W.C. Chairmen Charles Metcalfe, Tim Atkin, Derek Smedley, Sam Harrop and Michael Fridjhon endeavored to find the greatest and the best value wines. The champion award winners were presented at the I.W.C. Awards Dinner at Grosvenor House Hotel in London on Sept. 12. For the first time in its 24-year history, "responsible winemaking" was rewarded with three trophies comprising the I.W.C. Planet Earth Awards. The new awards were introduced to reflect an important trend in consumer demand and to acknowledge those who not only excel, but also put the planet at the heart of their winemaking. Testing for the 2007 contest commenced on April 16. Each wine was judged entirely on its own merit. Therefore an offering from a small, independent producer on the outer edge of the wine-producing universe had as much opportunity as a big corporation with vast resources. Entrants sent at least four sample bottles of each wine for the judging. By early April, more than 40,000 bottles arrived at the Barbican Center in London, where they were logged, categorized and coded by grape variety, style, country and region of origin in time for the first day of tasting. In the first round, all wines entered were tasted; wines from particular regions were tested against each other, i.e. Meursaults against Meursaults. For the tasting process, wines were "flighted" into groups of eight to fourteen wines of the same category, wrapped in a bag (to ensure the tasting was blind) and tagged. They were then chilled, if necessary. Up to 1,500 wines were assessed daily. Tables of at least four tasters — who were told what style they were judging and could inquire about the vintage, country and region of origin — scored the wine out of 100. Wines scoring above 85 points were deemed medal-worthy and sent to the second round. Wines that scored less than 84 were sent for re-tasting by the co-chairmen to ensure that a good wine was not missed. Provided that two of the four co-chairmen concurred, a wine could be put back into the running for a medal and head into the second round, or be given a Seal of Approval (meaning it was recommended as a wine worthy of purchase), or deemed un-recommendable and thus rejected from any further tasting. A member of staff at the checking table confirmed that the wine on the tasting sheet matched the one in the bag. In an average day, a judge on one of the 24 busy tasting tables might have seen between 72 and 90 bottles. The co-chairmen tasted up to 300 wines. If a wine was judged faulty at any stage, a replacement bottle was found and the suspect bottle sent to the Faults Clinic for analysis. In 2005, 5.8 percent of wines were found to be faulty — 4.09 percent were corked and 1.71 percent had other faults, either oxidized, reduced, volatile or unclean. 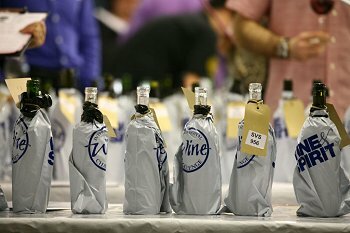 In the second round, wines that scored above 84 points in round one were assessed again, with the judges deciding which, if any, medal they should receive (a wine could still be rejected or given a Seal of Approval at this stage). Wines were still grouped by grape and country/region, although, for example, Meursault might be judged against other white Burgundies. The co-chairmen were again called upon to re-taste all wines in order to endorse the judges' decisions, medals were confirmed, and then it was back to the checking table to confirm the bottle's identity. In the final round of the Challenge, the co-chairmen tasted all gold-medal-winning wines, once again blind, against others in the same category, with the best of the best being considered for a trophy. The panel had the power to award new trophies, split them, or withhold them. The final task was to decide the winners of special trophies and the champion wines. Sake — Tsurunosato 2005, Kikuhime & Co.
Fortified Wine — Sainsbury's Taste the Difference, Emilio Lustau S.A.